It was a decaying relic, with an E Earthquake rating (the worst you can get) but has now been transformed into the Fenton Street Arts Collective — a combination of art gallery, espresso and wine bar. Back in 2016, Jo Stallard and Stuart Greenhill were on a mission to find a quiet place to paint and write. 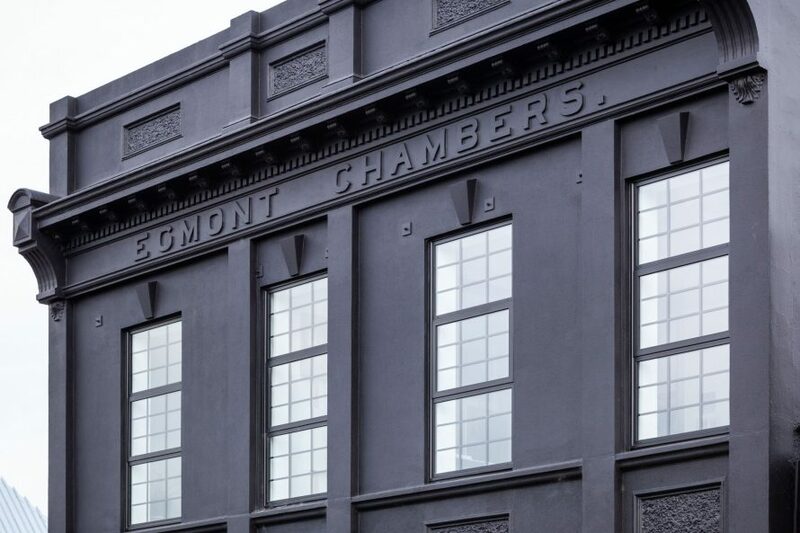 After an exhaustive search throughout New Zealand for an old building that didn’t cost an arm and a leg and still had bones to hold itself up, they found a two storey structure at 11 Fenton Street, Stratford. The exterior was peeling, an upstairs room flooded each time it rained heavily, ceilings had been lowered, there was asbestos, it was dark and dreary downstairs and compartmentalised into small offices throughout. In short, the place was a wreck, and yet, surprisingly, they liked it. The previous owner wanted to consolidate his investment portfolio and slow down. Having an idea of the work required to bring the building back to life he wanted to sell. The valuation was over $150,000 but Jo’s cheeky offer of $50,000 was, to her surprise, accepted. Jo along with Boon’s architect, Jono, believed a New York loft influenced apartment was viable in Stratford. This would take up the top floor and become the couple’s home and work studio. But what could be done with the dark, dank and dingy ground floor? Storage cells or just cells? Matt, from BTW was cautious but optimistic that after an earthquake assessment he’d have a plan Jono could work with. On this type of project the engineer and architect must work together, points out Stuart, particularly when large steel beams dictated the architect’s designs. Once Meco Engineers had plans to address the building’s earthquake E rating, ideas began to flow. Stuart says that’s the buzz about this type of development. Downstairs, many of the walls were weight-bearing and so most of the rooms on the ground floor have been retained. This has resulted in an intriguing gallery and cafe spaces, giving the venture an air of discovery. Groups meeting up can commandeer one of the ‘rooms’ and enjoy an intimate setting where everyone can hear the conversation. Because of this, the venue is ideal for work meetings and family gatherings — particularly if older people, or those with mobility issues are coming, as there are no steps to negotiate. Each space also has its own personality and varied seating arrangements … the one with it’s own fireplace will be a popular spot next winter after skiing or tramping. An array of food is on offer, both sweet & savoury, plus a range of platters available during the day and evening. The wine bar offers a selection from New Zealand along with French Reds. “We carry New Zealand craft beers and the only spirit on offer is our own gin,” says Stuart, indicating the copper distiller in a back room. “We could have torn it (the building) down and built apartments dressed with all the modern clichés for someone to then call theirs. Or we could have retained the footprint, left the truth exposed and lived within that rough-edged honesty, which is what we did. Part of that authenticity is choosing to leave the new strengthening steelwork exposed. “Steel is now part of the building like the exposed stone in the walls downstairs, the stripped timber architraves and plaster cast mouldings on the ceilings,” the couple say. Lighting tracks and various pipes are also exposed, giving the building an industrial feel. Interesting features throughout the building include columns with books inside, old coins in the concrete floor, a bottle in the ceiling, a Dominator garage door to the laundry and the names of famous writers and artists are on the steps to the apartment. Level 5 insulation has been installed in the interior outer walls and ceiling cavity, then ribbed to a smooth finish. The infinity gas heating system, has only been needed a few times over winter. “Insulation and heating are just as critical in renovating an old building as the steel,” the couple believe. Local builders, Lett’s Build, Project Managed. “They were brave enough to take on the task and have done a terrific job in marrying corners that didn’t line, dealing with surfaces that didn’t match and working alongside the engineer and architect,” says Stuart. Upstairs is the loft the couple live in. It consists of a large bedroom, bathroom, kitchen, lounge and ‘patio’. The apartment had to have an ‘outside’ space. Fenton Street did not have one, so an outside space was created inside. Brent from In 2 Kitchens, installed a large granite island. The adjustable feet were essential due to the variable floor level. The size of the black granite bench not only makes a statement but highlights the copper in the marine light hanging over the sink, the Rimu architraves around the windows and remarkably authentic-looking brick wallpaper. Double-glazed loft windows replaced all the old windows on both floors. These are framed inside the original architraves that Stuart spent months stripping back to expose the original timber. Stuart says, ‘A good Project Manager will know the value in recycling. Nearly all the Matai, Rimu and Oregon was reused. The new business opened in early October. This project was self-funded but it’s important to check whether your bank will support your earthquake restoration — some won’t.